This is a wholesome snack packed with protein for all my vegetarian followers out there. It is egglesss and perfect for vegans too. I have given a different twist to this snack using different kinds of lentils so its perfect for those who have a little of each kind of lentil in their pantry and dont know what to do with it!! You can also omit one of two of the lentils or use the ones you have at hand!! drain all the soaked lentils and grind them in a blender with as little water as possible together with the ginger, garlic, green chillies and coriander leaves. Add the spices and salt to taste and leave the batter for about 2 hours at room temperature to ferment. 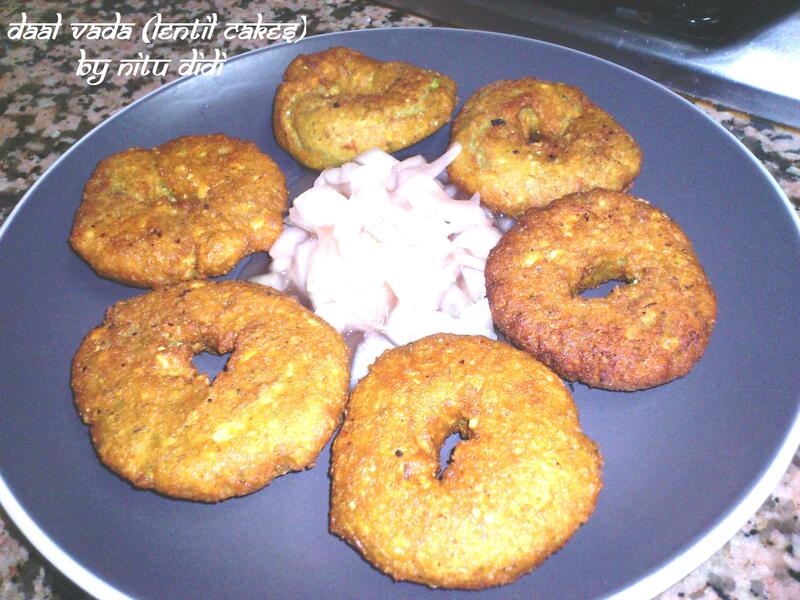 Heat the oil in a deep fryer and now to shape the vadas: wet your palms a bit with water and take a bit of the lentil paste and shape it into a ball and then flatten it carefully. Make a hole with your finger and slide carefully into the oil without burning yourself. If you find this difficult just use the spoon to scoop spoonfuls of the batter and put into the oil and deep fry till golden brown and crispy. Serve with chutney of your choice. I served them with sweet and sour onions. Chop onions and add salt and sweet and sour sauce to them and let them rest for about 2 hours in the fridge so the flavours blend. This entry was posted in Everything Vegetarian, Gluten Free, Lentils, Veg Starters, Vegan and tagged gluten free lentils, lentil cakes, lentils, vegan lentils. Bookmark the permalink. These look so good! I don’t cook with lentils nearly enough, that needs to change! Looks good. But can I omit garlic?